Tracking the untrackable – Where do Melbourne’s Powerful Owls go at night? Iconic, illusive and impressive. There is no doubt there is a certain mystique about Australia’s largest owl, the Powerful Owl (Ninox strenua). Almost without exception, when people see one for their first time, their response is excitement and awe. This is amplified even more if the owl is sitting holding a decapitated possum, their favourite prey. Our team under the leadership of Associate Professor Raylene Cooke, along with our amazing research students, and the countless wonderful volunteers have been trying to understand how this amazing animal survives in urban landscapes. Raylene has been working on this species for over 20 years, with the rest of coming and going along the way. What we have learned has been great, and the adventures along the way fun for everyone. A male Powerful Owl sitting on an unlucky Common Brushtail Possum. This owl was in a reserve along Melbourne’s Yarra River. Note: It is roosting in an exotic Willow tree (which was subsequently removed as a weed management plan). We now know a reasonable amount about Powerful Owl ecology across much of their distribution. Their diet is well documented, we have a reasonably good understanding of their habitat preferences, and where their habitat is, but one glaring hole has been in regard to how much space they need and how they use this space. This has critical implications for how we manage landscapes if we hope to protect this species. 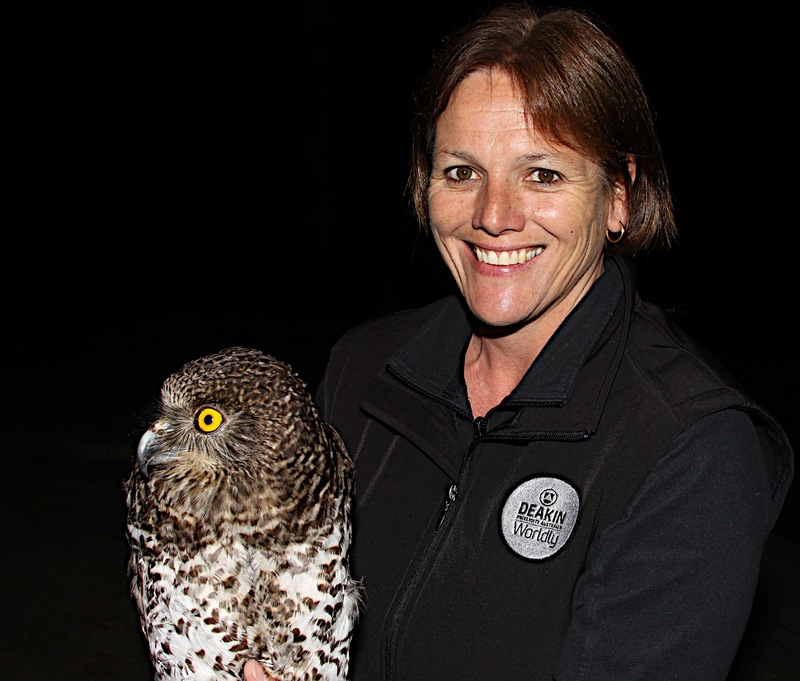 Raylene with a male Powerful Owl ready for release. So why do we know so little about how they move around their environment? The simple answer is they are a challenge to find, and on top of this ridiculously difficult to capture. In fact there are only a handful of people in Australia who have successfully captured more than one owl in the wild. Unfortunately, to find out how they use space we need to be able to put a tracking device on them, and this requires them to be caught. I won’t go in to capturing them, I will say we use nets and playback, and it is a game of persistence. Often it takes us several nights of work to manage to capture a single bird. Me with a female Powerful Owl we captured in a riparian reserve in suburban Melbourne. It is a rare privilege to hold these amazing creatures. Even when you have captured an owl, the challenges keep on mounting. How do you track a cryptic, wide-ranging predator across challenging landscapes often with lots of private land? Traditionally, we would have put a radio transmitter on the captured birds and basically follow them around on foot getting locations. We have done this for a couple of birds, and I can tell you it is difficult if not impossible to get a comprehensive understanding of everywhere they go. Sometimes, they just get up and go and you can’t find them. Where did they go? And of course this is amplified in urban settings where much of the landscape is privately owned and tracking across it is near impossible. Arrive the age of the GPS. GPS technology has been around for a long time, but it has been expensive and heavy. Now, however, costs are declining and the weights are reducing. So with that in mind, last year we decided it was time to have another go at trying to understand how Powerful Owls move around Melbourne and its outskirts. We may have been a little over-confident, but if we are anything we are persistent! So we designed a unit with a cheap GPS logger and a radio transmitter packaged together to be tail mounted to a Powerful Owl. For the tech heads, each unit was on a separate battery. So the GPS logger would work for about 30 nights taking a location every 20 minutes, and the radio tracker would work for about 6 months. Some of you may have been on the ball enough to note I said “GPS logger” which means the data is stored on board. Yes, that does mean we need the unit back to get the data! The radio transmitter certainly aids us here. It helps locate the birds to target re-capture locations, or to find a tail mount that has fallen off the bird. As of next week, we will have new GPS units in our hot and excited little hands. These GPS units will be able to take locations for up to 3 months due to the low power GPS, but the biggest bonus is they have UHF download capacity. What does that mean? Basically we can use UHF to occasionally download data, which means we can progressively follow where the birds are going, and we can get data back even if we can’t catch the bird back. Very exciting!! A tail-mounted GPS logger and radio transmitter package on a male Powerful Owl. Please note once the bird is released the tracker is quickly covered with feathers and the only evidence you can see is the aerial attached to the tail feather. So, for the last four years we have attempted to track Melbourne’s Powerful Owl movements. This has been a massive team effort, in particular our honours students Nick, Nick (Yep, 2 Nick’s in 2 years) and Jacque. The first Nick is now back with us doing a PhD on the spatial ecology of urban owls. Countless days in the field trying to find owls, and then many nights in the field trying to capture owls to attach trackers, and then more nights trying to get them back. Believe me, this is not an easy task and Powerful Owls do not give up their secrets easily. 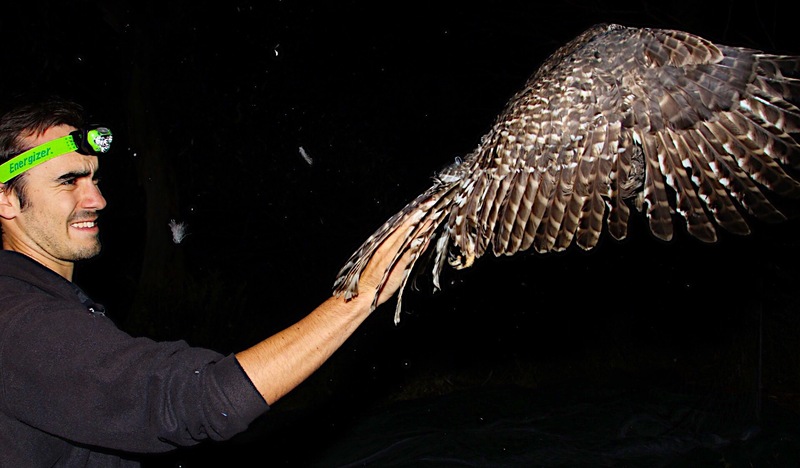 Deakin honours student Nick Bradsworth releasing a male Powerful Owl carrying a tracker. This bird ended up having the biggest home range of any of the owls we have tracked. What have we managed to achieve? Let me start by saying I am generally a numbers person, and sample size is something I strive to maximise. We have managed to successful get trackers back for 13 of Melbourne’s Powerful Owls, representing 12 different breeding pairs. We have a number more loggers out on birds at the moment, increasing our coverage of greater Melbourne’s owls. Finally! Retrieving the tracker from our 8th Powerful Owl, 7 months since her initial capture. It is an exciting time when we get a tracker back. Tradition is the data is downloaded in the field just because there is no way anyone is willing to wait! Image is of Nick Carter who did his honours with us and has since been an amazing volunteer in the research. A few of the things we have learned along the way. Firstly, Powerful Owls do not give up their secrets easily. Powerful owls around Melbourne have relatively small home ranges compared to previous forest estimates. Females cover about 415 ha, and males about 700 ha. This compares to over 1000 ha for the few tracked forest birds. Powerful owls appear to align their home range to avoid impervious surfaces (the highly urban areas) and utilize the trees, rivers and grassed areas. Powerful owl BBMM home-ranges against a land-use environmental layer. A is a female and B is a male. Thick black lines and thin pink lines represent entire home-range (99% BBMM) and core-range (50% BBMM) respectively. Background, light green represents grass/agriculture; grey is impervious surfaces; dark green is tree cover; light blue is perennial rivers and dark blue is water bodies. Figures from Nick Carter. One of the really interesting outcomes of having a GPS take a location every 20 minutes is that you get a feel for how the animals move through the landscape. If you watch the following video of a female owl on the urban fringe of Melbourne you will see how they use trees to link up the patches of forest. Hopefully, you will agree it offers an impressive insight into how these animals cope with landscape fragmentation. The neat thing is with some cool modelling you can use direction, distance and turn angles between different location to assign behaviours to movements such as foraging etc (see Joining the dots link below for the paper from this). As we continue to build sample size, we are starting to look at how owl ranges are aligned. We are slowly filling in the gaps between home ranges of different birds and seeing how their territories overlap towards the edges. Very cool! We plan to continue to track more owls to try to get as comprehensive an understanding as we can about how these illusive creatures of the night move through our urban landscapes. If you can not access and would like a copy feel free to email me. Apex predators are critical to ecological function, however their life history traits are often not conducive to survival in urban environments. While this can result in the loss of some apex predators, others are able to inhabit and utilize urban environments. Understanding predator resource requirements and the factors driving their distribution is often difficult due to their cryptic nature, however, this understanding is essential, given the current rate of urban expansion. In this research we use a threatened apex predator, the powerful owl (Ninox strenua) as a case study. 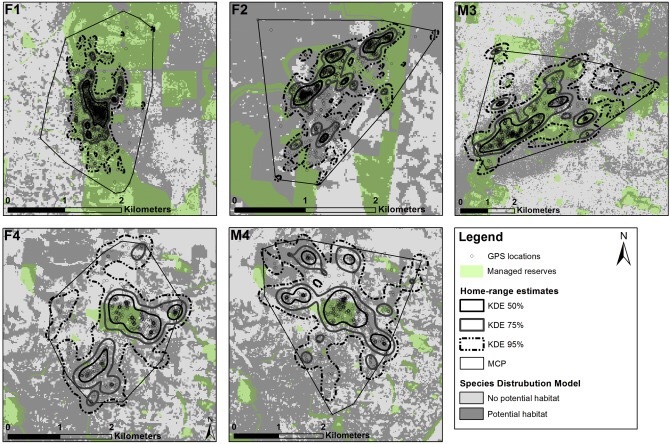 Specifically, we aim to (1) develop a Species Distribution Model (SDM) to ascertain environmental variables driving habitat suitability across an urban gradient (2) determine fine scale spatial movements of powerful owls using GPS telemetry; (3) validate the SDM against collected GPS movement data; and (4) evaluate habitat predicted by the SDM against current reserve systems to establish whether they are adequate for the future protection of this species. We used MaxEnt and citizen science data to produce SDMs that predicted habitat suitability for powerful owls and identified the environmental variables driving habitat across the landscape. Fine-scale spatial movements for urban powerful owls, gained via GPS telemetry, were used to establish home-range sizes, validate models and assess the fit of telemetry data against SDM predictions. Rivers, vegetation (particularly dense tree cover) and distance to riparian areas were the ecological variables driving predicted habitat for powerful owls across the urban gradient. There was a strong relationship between habitat predicted by the SDM and the fine scale movements of powerful owls in urbanized environments. Home-ranges within this urban study were notably smaller than previous estimates established for forested environments. The powerful owls in our study were also shown to utilize considerable amounts of habitat outside of the reserve system. This has severe conservation implications because it is often the space outside of reserves that are at most risk from urban intensification. Conservation of the powerful owl in urban environments, therefore, needs to focus on both habitat management within existing reserves, and on establishing clear vegetation management strategies in the surrounding urban matrix. Download for free for a limited time! I guess if I was asked to define myself, I would say I am a wildlife ecologist, for want of a better term. The reason I became an ecologist is because I have always been intrigued by wild animals, but more importantly how they fit in the bigger system, and how these systems function. As I have grown older my interest has more and more turned to how we can help ecosystems either stay healthy, or improve their health. As a species we have changed and adapted landscapes to suit our own purposes, this has led to the extinction of species and caused enormous changes to the stability of what natural ecosystems we have left. We need to do something to change this, and in the light of climate change, we need to do something now. So why am I writing this post? Recently, I have been incredibly saddened to see myself and fellow scientists routinely attacked in social media for voicing views around the need to proactively manage species and ecosystems to improve conservation outcomes. One of the great things about social media has been the mainstreaming of conversations between experts and the public. It has been really good from both perspectives, but….. So, here is a small sample of comments I have recently received (very much edited to remove the venom) and a few of my thoughts. As pointed out above, I agree, as a species we have had a ridiculous impact on the planet. We should indeed be working towards ways of reducing our impact on the environment, limiting the spread of our cities etc. I am however, a wildlife ecologist, so my capacity to personally shape the management of humans is well beyond me. What I do know, is that if we leave ecosystems to run their own course until we “manage” human growth and expansion, we will lose species. Lots of them. 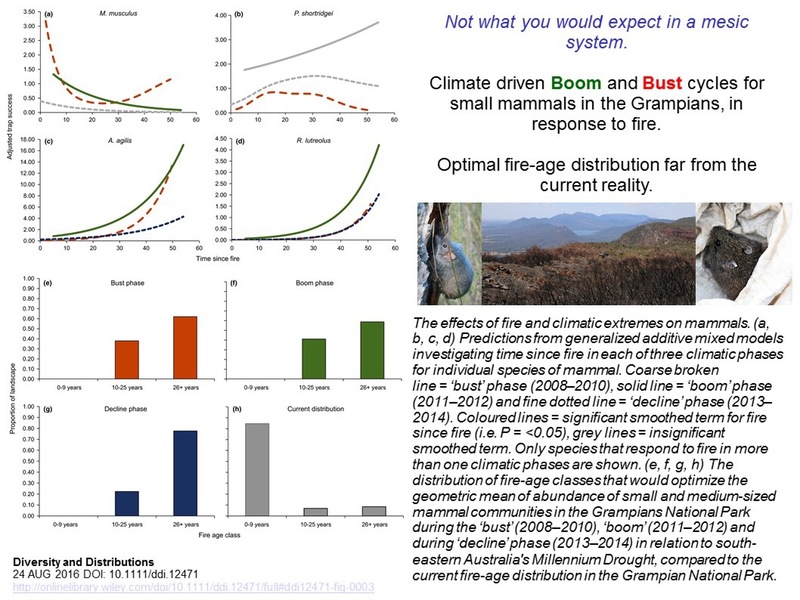 So, I am of the view we need to be doing both things at the same time, yes we need to be better at managing human impacts, but we also need to be managing the threats that compromise ecosystem stability at the same time. I am constantly amazed by animals. I have always been fascinated by them. And in fact, the reason I am what I am is because of these factors. Unfortunately, I am well aware of the impact species introduced to Australia (and yes I have been told I am one of these, and I should leave), are having on ecosystems. Predation by foxes and cats are both recognised as major threatening processes within Australian ecosystems. When we choose to make a decision to not manage them, we are making a decision to consign other species to extinction. So this becomes a value judgement, would you prefer cats and foxes or native species? The argument that cats and foxes need to eat, and are just doing what cats do is exactly the problem. Cats and foxes eat our wildlife, and many of our native species are not capable of responding to this increased predation pressure. Effectively, many ecosystems are on the edge (due to human impacts), the addition of cats and foxes are pushing species in those systems to a point of extinction. So, yes, I do support the management of foxes and cats to reduce the impact they have on native species. This does, however, need to be strategic, effective and targeted at reducing impact. A feral cat in the Grampians National Park carrying a bird it recently caught. This is in a high conservation priority area of the park. Native species can not be overabundant, they have looked after themselves for thousands of years. The concept of density regulation has been around for a very long time in ecology. Species respond to changes in resources both positively and negatively. Human activity has definitely favoured some species whilst negatively impacting the majority. Some of our native herbivores can fit into the situation where they have been benefitted positively by the interface between natural areas and agriculture or urbanisation. Technically they are not overabundant, they are just tracking resources. The problem comes however, when the resource levels decline sharply with droughts. We do see massive natural mortality. In some countries, populations of native herbivores are managed to limit the upward spike of their population to reduce the impact of the inevitable downward movement. Eastern grey kangaroos at the interface between the Grampians National Park and agriculture. There is no doubt in my mind that we need to be proactive in managing the threats to our native species and the ecosystems that support them. I have a personal view that our priority should be in favour of native species over species exotic to Australia. I find the argument of letting cats and foxes be cats and foxes in our native ecosystems extremely distressing. Effectively we are favouring these two species over the entire suite of native species they impact. We do need a discourse between science and the public, and social media is no doubt a fertile ground for discussion. But we need to keep it civil. The constant trolling by individuals is not healthy for debate, or frankly the mental health of the people who are being trolled. The increase in activists trolling and attacking people is only going to lead to people deciding not to communicate ideas through social media. At the end of the day we all lose. P.S. I am not a vegan or an animal activist. Contrary to a number of recent tweets to me, I do not think this makes me a bad person. Diary Entry. May 9 2031. Here I go again. Another long trip to the Grampians. Hard to think of how many times I have done this trip since 2008 when we started work here. A life time ago, and how much things have changed. I will never get used to sitting in a car with no steering wheel being guided by a computer. My students call me old school on a good day, an old fart on a bad day. Today may well be the worst day of my career. The media circus is converging on the Grampians for two major announcements. Today the Grampians National Park is formally going to be renamed the Great Grampians Desert National Park. Some bureaucrat in Melbourne thought adding Great to the name would soften the blow and of course the politicians agreed. Idiots! Looking for the easy and popular answer was what got us into this position in the first place. The other announcement today, the one that makes my heart bleed, is that we will be declaring Antechinus agilis extinct in the Grampians. This comes on top of the previous extinctions of southern brown bandicoot, long nosed potoroo, swamp rat, smoky mouse, heath mouse and dusky antechinus. I can’t believe that we have lost one of the most common small mammals that existed in this landscape! Antechinus agilis. Once one of the most abundant and wide spread small mammals in the Grampians, today declared extinct. It really didn’t take much for the end of the Grampians. The annual rainfall declined to 339mm with the odd ‘better’ year. The really low years were always followed up by a landscape scale wildfire which consumed vast areas of the park. Ultimately the system could not cope with the lack of water, and the repeated wildfires. This unfortunately, is exactly what the scientists predicted would happen to our climate very early this century. I would never have imagined that the ecosystem collapse associated with human induced climate change would have been so rapid and so complete. Of course I am not allowed to say “human induced climate change” publically, as such references were outlawed by the Federal government. Public debate about the climate, and our role in it, was totally quashed. Schools and universities we given new curricula by the government, and those that disagreed and spoke out were sentenced to life on the Manus Island Detention Centre (Funnily enough Manus Island is somewhat smaller now than it was then, but we are not allowed to discuss sea level rises either). It really didn’t take long for the public to ‘get the message’. Once a few environmentalists (Bob Brown and Tim Flannery being the most obvious) were ‘re-deployed’ to Manus for the term of their natural lives, people stopped talking about climate change. How did we get to this point where the last of the small mammals has gone from the Grampians? Surely we had chances to do something to avoid the collapse of ecosystems we have seen around the World? Of course we did! We chose not to! Politicians told us the changes were not real, or at best natural swings which would correct themselves. They told us it was too expensive to do anything about it, and it would cripple our economy (Now we hardly have an economy, so I guess they got that wrong). The worst thing about this, those politicians that denied the science and ridiculed scientists so effectively in the public’s eye are all retired and further crippling the economy on their enormous superannuation packages that they locked in to law prior to the collapse of the economy. How do our possum assassins use urban landscapes? An urban living possum assassin (AKA powerful owl). We are incredibly lucky to have a native apex predator haunting our urban landscapes. The powerful owl (Ninox strenua) is known to live in restricted areas of Melbourne, Sydney and Brisbane. They silently travel around dropping in on unsuspecting possums and gliders, and feasting on them. It is not uncommon to encounter an owl with the decapitated corpse of a possum in its talons. Enough with the gore! What do we know about these amazing predators in our urban environments? We know they are not very common in urban environments, and large areas of our cities are completely unsuitable for them due to loss of vegetation associated with urbanisation (Click here to check out some models of habitat for powerful owls in Melbourne). We also know there is plenty of food for them in our cities, but their capacity to breed is probably limited by a lack of large tree hollows (Another paper that may interest you on urban ecological traps for powerful owls). Ok, so what don’t we know? Well we really don’t know too much about how powerful owls use the urban landscape. How far do they travel? Do they go deep into the suburbs or do they stay in the more wooded parks? How much space does an owl actually need to survive in a city? How can we better manage our urban landscapes to facilitate the expansion of powerful owl populations? Hence our new research project to track urban powerful owls in Melbourne. This research is part of our Deakin honours student’s (Nick’s) project. A parallel project will be aiming to do the same thing in Sydney, so we can compare and contrast two different cities. So last night was our first night of trying to catch a powerful owl to put on a GPS logging device and attached radio transmitter. I will say it is not easy to catch owls, and we have done it a fair bit so have a few little tricks we have learned along the way. As luck would happen we caught one! First attempt! There is no way we will be maintaining that average! Deakin honours student Nick with the first powerful owl of his research project. I think he looks kind of happy. Imagine sitting in the dark, nets up in the canopy, knowing there is an owl close by. It is exciting, and scary at the same time. The owl never called, it just quietly cruised around where we were. So last night the owl came into the net. We were lucky, and this launched us into a flurry of activity and fitting of trackers etc. How do you attach a tracking device to an owl? We used a tail mounting approach, where the device is fixed to the two central tail feathers. It is a useful approach as the tail feathers will eventually naturally moult and the device will fall off the animal. Also, the device sits very nicely to not impede its flight. Finally, the feathers of the back and wings cover the device up so you cant see it. The GPS/radio tracking device fitted to the tail feathers of our powerful owl. Note: all the other tail and back feathers are being held out of the way to show it to you. So after fitting our tracker to the owl, we gave it a final check to make sure both the owl and the device were fine. Nick held the owl up in the air, and whoosh, it was gone. It flew really well up to a nearby tree. I might of imagined it, but I am sure it gave us a dirty look before heading off through the trees. And Whoosh off it goes! Nick releasing the first powerful owl carrying a GPS tracker. The owl just after release perching briefly on a branch. Note you can just see the tip of the aerial at the end of the tail, and the tracker is held nicely under the feathers. We checked the owl a couple of times last night and again this morning. It is doing really well. This morning it was roosting with another adult powerful owl some 500 metres away from where we caught it. The GPS recording where it goes when we are not watching it. Technology has come a long way, and with every technological advance comes opportunities for us to understand our wildlife better. This owl may be able to help us design urban landscapes better to suit the needs of our wildlife. Me with the owl. It really doesn’t look all that big, but this owl was just over 1.5 kg! It’s time for an urban revolution! It’s time to take back our streetscapes. A tawny frogmouth pair sitting in an urban streetscape tree in Melbourne. Other than houses and roads, one of the things that are most visible to people in our urban environments are the streetscapes. The foot print of streetscapes throughout our urban areas is enormous yet their potential for great biodiversity outcomes largely goes unrealized. In fact we generally manage them in a fashion that creates an ecological desert (maybe a little poetic license) with extremely limited value for biodiversity. Many years ago we investigated the role of different streetscape vegetation and the response of birds to it (You can read more here). Surprise, surprise, native bird diversity was highest in streetscapes dominated by native trees. Probably more concerning was the fact that 75% of the bird abundance in streetscapes dominated by exotic trees was made up by a few species introduced to Australia! Upshot, streetscapes dominated by lawns and exotic trees are not good for birds, and presumably native biodiversity as well. Interestingly, in Australia, we refer to streetscapes as nature strips. Whilst this may make us feel better about our impact on the environment, it is a grossly incorrect term. In reality, as far as nature is concerned, streetscapes sit on a continuum from ecological desert to nature strip. So just calling it a nature strip does not make it a nature strip. So here comes the revolution bit. What can we do about it? This is actually a tough one. I used to give lots of talks to local government about turning streetscapes into nature strips. Obviously step one is pushing for native tree species to be used throughout our urban areas rather than the exotic European species favoured by many urban designers. I was often surprised to find a backlash to this on various different levels e.g. “Native trees do not have the great form that exotic trees have”, “Native trees drop limbs and leak sap”, through to “This will impact upon the value of the houses”. This last point a reference to houses in areas with established exotic trees having higher value. Probably correlative rather than causative. I usually took my recommendations a step further and encouraged councils to consider ripping up the lawns and replacing them with native vegetation. Ultimately, suggesting the idea of introducing structural diversity to the planting. This usually got many and various different responses, it must be noted not always negative. The main negative, other than the negative aesthetic influence, was the issue of public safety. In essence with structure on the streetscapes the public have no line of sight and as such perception of risk and safety is influenced. I actually think this is a valid point that we need to think about. Personally, I think we need to take control of our streetscapes, and I think we need to have a revolution that forces local governments to act in favour of nature rather than against it. We need to fight for a diversity of native canopy trees to be the dominant vegetation on all of our streets. Following this, we need to rip up the lawns. Replacing the mown and managed grass with diverse low growing (less than a metre) native vegetation will have enormous benefits for native biodiversity. If everyone in a street did this, would councils force them to change it back? Who knows, but it would make for an interesting situation. A native heliotrope moth. Elevated richness of native invertebrates will result from turning streetscapes into nature strips. Finally, coming back to the point about structural plantings and safety. I do agree with the issue around perception of safety, so how do we deal with it. Actually this is somewhat more straight forward than one would think. We can get structure into our urban environments by thinking of our streetscapes and our front gardens as part of the same system. Spatially they are only a few metres from each other. So use the streetscape to enhance the canopy and low growing vegetation, and utilise your front garden to add a bit of mid-storey structure to the system. Imagine your own street. Imagine being immersed in an urban woodland. Imagine walking through it to the sound of native Australian birds, and watching the bees and butterfly’s etc. Would that elevate your perception of wellbeing? Research suggests it would. Would it feel cooler in the summer? Again, research suggests it would. Ultimately, imagine your entire city dominated by streets like this. What are you waiting for? It is time for an urban revolution. Boschma's Gliding Lizard (Draco boschmai) hanging on a tree in Flores, Indonesia.